The jit.ayuv2uyvy object converts a 4-plane char AYUV (alpha, luminance, signed chroma blue, signed chroma red) matrix into a 4-plane char UYVY (signed chroma blue, luminance left, signed chroma red, luminance right) matrix. Alpha channel is lost and the horizontal dimension is halved to account for this half chroma, macro pixel out format. The UYVY format is typically useful for efficiently transfering chroma reduced codecs to the GPU without the expense of colorspace conversion, or bandwidth requirements of a full chroma format. 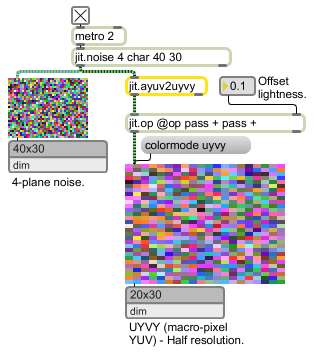 Unlike UYVY data, AYUV data has an alpha channel and full resolution chroma data.